United State’s Consul General in Kolkata, Mr Craig L Hall who called on Chief Minister Kalikho Pul today said that the US companies are keen in developing NE economy. He said that private companies of the United States are looking for ways, though difficult it seems, for more connectivity in the region so that pace of developmental activities in the region can be accelerated and added that they are very much interested to expand their business in NE India too. “In fact, the US govt is working with the Indian Govt to promote business relations with NE India” he said. Pointing to the big market of hydro-power and tourism potential of the state, he said reports of business opportunities of the state can be sent to the Ambassador in Washington to encourage business in this direction. He put forward his opinion to the Chief Minister for global tendering of the hydro-power and infrastructure developments projects of the state, so that the advertisement can also be sent to the business companies in US. Mr Craig also informed the CM that there are educational exchange programmes for teachers and professors between India and the United States, and the teachers & professors from the state can take advantage of the programme. He informedthere is also a Youth Exchange Study (YES) programme for the high school students, who canundergo one year study in US under this educational exchange programme and for that the student has to applyto the US Consulate Office in Kolkata. On repeated claims of China over Arunachal Pradesh and some part of Assam, the Consul General said that the US Govt is very clear that Arunachal is an integral part of India. He observed that India’s Look East Policy can be strengthened if road connectivity in the region is developed well, as Arunachal is located in a strategically important position having long international borders with China, Myanmar and Bhutan. 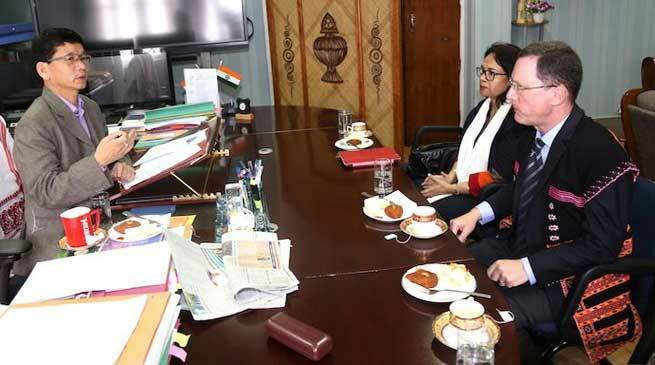 Discussing on various issues pertaining to development of the state and NE Region, Chief Minister Kalikho Pul sought the support of the United States in developing road connectivity and harnessing hydropower of the state. He informed that Arunachal has the potential of generating one-third of India’s power needs and said, “United States can use their technology of generating hydro power in the state”. He said, “Western investors should feel free to invest in Arunachal”. Chief Minister further sought the assistance of the United States in getting loans from the Asian Development Bank and other world’s banks for various development projects in the state. He also asked the United States government to check and help in rectifying the world wide Google Maps wherein China has indicated Arunachal and some parts of Assam as a part of China.